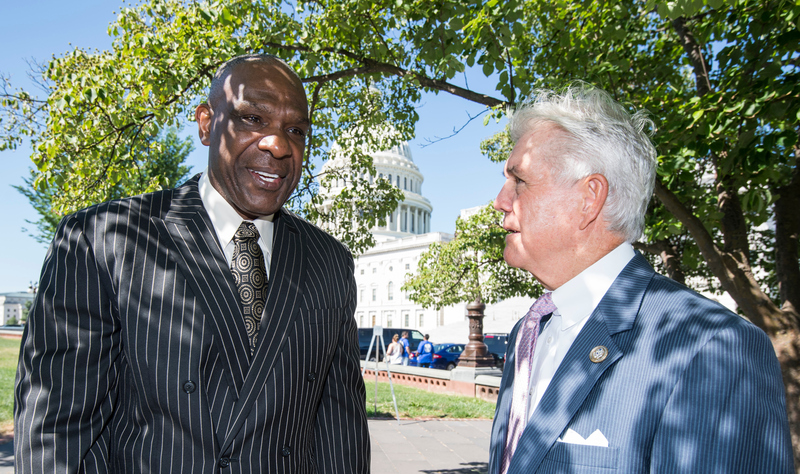 Baseball legend Andre Dawson was on Capitol Hill on Wednesday, helping to get an early start on marking the 75th anniversary of the integration of Major League Baseball. He joined lawmakers at a news conference to talk about legislation that would create a commemorative coin in the shape of a baseball home plate depicting baseball pioneers Jackie Robinson and Larry Doby. If enacted, the coin would be ready by 2022 for the 75th anniversary of the integration of baseball — Robinson debuted for the Brooklyn Dodgers on April 15, 1947, and Doby for the Cleveland Indians on July 5 that year. Joining Dawson at the news conference were Texas Republican Rep. Roger Williams and Louisiana Democratic Rep. Cedric L. Richmond, who introduced the legislation in the House; and South Carolina GOP Sen. Tim Scott, who introduced the bill in the Senate where New Jersey Democrat Cory Booker is a co-sponsor. Dawson said he is an avid coin collector, which added to his excitement. He played for the Montreal Expos, Chicago Cubs, Boston Red Sox and Florida Marlins during his 21-year career and was inducted into the Baseball Hall of Fame in 2010. “I’m now standing next to Andre Dawson. I realize why I never made it to the next level,” joked Richmond, the Democratic baseball team’s star pitcher, who played college baseball at Morehouse. “In these divided times, Jackie Robinson should serve as a reminder that the baseball diamond should be a place where people of all colors and creeds can come together to participate in one of America’s great traditions,” Richmond added. Scott talked the legacy Robinson and Doby left behind. “If it wasn’t for folks like Jackie Robinson, folks like … Larry Doby, myself and Cedric Richmond could not be here today. The fact of the matter is that we stand on those shoulders of giants. Men that went through things that today are harder to imagine than they were at the time, men who suffered violence, challenges,” he said. Williams said he never played with an African-American teammate in college at Texas Christian University, but added that he was able to meet both Robinson and Doby during his professional career with the Atlanta Braves. Correction 10:15 p.m. | An earlier version of this story misstated one of the teams Andre Dawson played for.